FUUSE is an open and accepting inter-generational community where all are welcome and valued. We encourage intellectual and spiritual growth through exploration and action. We celebrate our connections to family, to our community and to the earth. Get to know us by attending worship services, potlucks, circle dinners, newcomer tea, classes and other events. If you have children who are interested in attending, check out our Religious Education programs. Introduce yourself to our minister, Kendra Ford. Fill in a blue card to let us know your interests and sign up for our weekly communication. Stop by our membership table with any questions. After attending for a short while if you are interested in joining please let our Minister know or stop by our membership table to let our Membership Chairperson help with the necessary procedure. Ask for our Membership Information Packet at the Membership table in the Community Room. The packet contains information about Unitarian Universalism and FUUSE that should help you decide about membership. 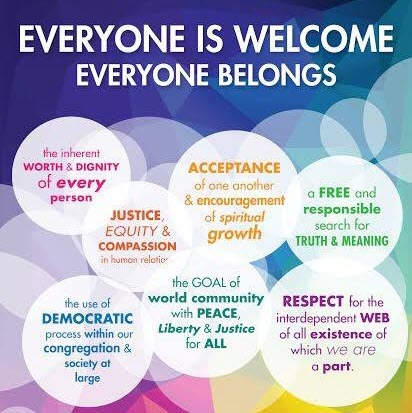 Try to attend a new to UU class, where you will learn about Unitarian Universalism and meet other newcomers. You will learn about the responsibilities and benefits of membership. If you simply cannot attend, please make an appointment with our Minister. Fill out the forms, once you’ve decided to join. Ask for the form in the office, or pick one up at the membership table in the Community Room. Once completed this will be sent to the office administrator. Once you become a signed member you will also begin receiving the UU magazine from the UU Association, UU World. This form asks you to estimate the financial support you expect to give the church. The congregation adopts a budget in May/June for the new fiscal year based on expected income, determined by member pledges. There are paper versions available in the office, and there is an online version. If your children have already been attending Sunday morning programming or youth groups, you may have already enrolled them via this form. There are paper versions available in the office, and there is an online version. Once you have completed the necessary requirements you will be invited to attend the next New Member Welcoming Ceremony, held one or two times a year. New members will be introduced to the congregation during the service and you will be recognized as a new member and you will be asked to sign our membership book. Join in. Continue to come to services on Sundays and other events throughout the year. Find the areas of our ministry that appeal to you, both as a participant and as a volunteer. Come to congregational meetings to participate in our governance so you can vote and help guide FUUSE. Members of FUUSE consider it their “spiritual home”. Members enjoy the benefits of this home and carry the responsibilities for maintaining it. Our worship services bring us together as a loving community, uplifting our spirits and touching our hearts. 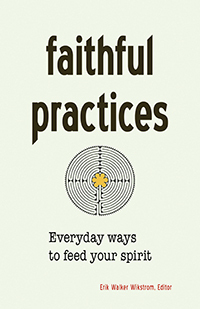 They foster our spiritual growth, provide us with time for meditation and transcendent music, and challenge us to live our lives according to Unitarian Universalist principles and beliefs. While the Minister leads most of the services, we also enjoy guest preachers and lay led services. In weekly worship, members have opportunities to play many key roles. FUUSE has a strong tradition in social action, and in being a catalyst for progressive change in the Exeter area. Members can work with others to give back to the community through programs such as CROP walk, Outreach sponsored thanksgiving baskets, Santa gifts for seniors, monthly food donations to food pantries and 48 hours of hunger. Group and individual social opportunities abound. Our hospitality group sponsors pot lucks, circle dinners, educational evenings. There are annual fundraising events from auctions, to fun gatherings. New friendships are quickly made at FUUSE. Members are expected to participate in Sunday worship and church activities. This is critical to keeping our spiritual community strong. Members are expected to support FUUSE financially. FUUSE is totally self -supporting. While no specific amounts are prescribed, all members are expected to make a pledge for each fiscal year, from July to June. The member’s pledges form the basis for all budgets and financial plans of the church. Members are encouraged to participate in the democratic governance of the church This includes attending and voting at the annual meeting (where the budget is approved). Participation in various Committees, Task Forces and small groups where the work of the church is performed. Members define the vision and the mission of the church, within the broader principles of Unitarian Universalism.